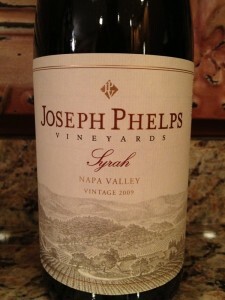 I love being a member of the Joseph Phelps “Red Wine Club”! If you are not a wine club member, there are many reasons why you might consider it. Some of the reasons why I appreciate my membership included the fact that we truly enjoy the private tastings with Claude. We have had numerous visits with Claude over the years and each time it is just as pleasurable as the first time. He does a great job describing the Phelps wines and he usually includes a special treat when the tasting is nearing completion. Another pleasurable experience is simply hanging out on the terrace and having a picnic lunch. You have to call ahead and reserve the picnic table, but it is a very relaxing experience. Every time we are scheduled for a private tasting, we end our time at the picnic table with lunch. My favorite reason for loving my membership is Insignia day! Its a day of celebrating food and wine and is reserved for members only. I look forward to trying older vintages that the Phelps staff brings out in special decanters. While enjoying the event you might see a crowd, if so there is always an older wine being poured. Be sure you stay hydrated and eat the excellent food, because they are generous with the wine! I received my fall shipment early in the week. 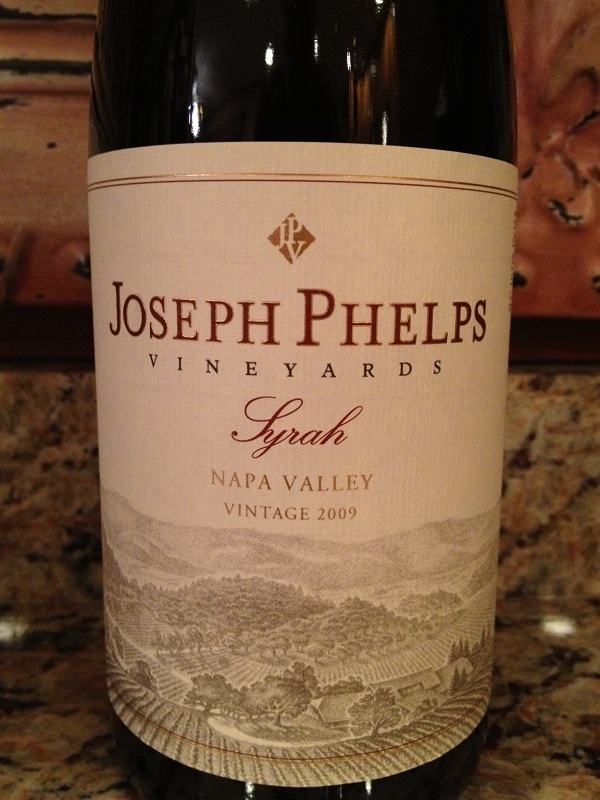 This time there were two bottles of Joseph Phelps Syrah along with a 2009 Insignia. Unfortunately, Phelps did not have enough Backus this year and I apparently missed the email request and didn’t receive any this year. I’m bummed but “It is what it is”. There is always next year, right? The evening came and the dinner was in progress. I was done with my meetings so I joined her in the kitchen while she prepared sauce. With the water boiling, she was about to add the pasta. Another pan had onions sauteing. There were many wonderful smells in the air and I was happy! Chris was making Tilapia with a yogurt, mint, garlic and basil sauce. She also prepared home made pasta with pesto, as well as sauteed onions and petite zucchini. I knew hours earlier that I wanted to have the 2009 Syrah so I had it chilling in my wine cooler. If you recall, Syrah is Chris’ favorite so I wanted to please her. It was time to grab the Syrah from the cooler and pull the cork. The temperature read 61° so I grabbed a cork screw along with my tasting sheet. So with a nice “Pop”, my tasting sheet was ready and I started to right down my thoughts of the 2009 Joseph Phelps Syrah. The color depth was deep, not at all a watery looking wine. I was impressed with the Purple hue. Quality wines look rich! 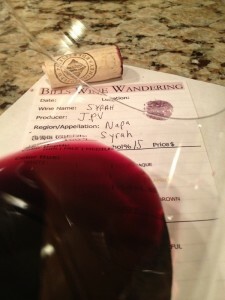 The 2009 Syrah was very aromatic and smelled young and fruity. I could smell dark red fruit like Blackberry and Blueberry as well as a slight Oak nose. An excellent Syrah! The Syrah was full bodied and the acidity was right on. The tannins were medium, soft, and felt in my mid palate. It was very flavorful with a long finish! The flavors I could identify were slight spices, Plum and Cocoa. After the wine sat in our glass for a while, we could taste Chocolate covered Cherry! Chris truly enjoyed this 2009 Syrah, as did I. We both rated the 2009 Syrah four glasses.